Shampoo made using Australian Tea Tree Oil that has fantastic anti-bacterial and anti-fungicidal properties. To assist with calming the scalp and soothing itchiness there are extracts of Calendula, Hops, Sage and Wheat Germ Oil, and to help clean and support hair follicles protein and Grapefruit Extract are included. This is a shampoo that is tender enough to your scalp for everyday use. It will caringly clean and support your scalp to reduce the build up of dry, flaky skin. Using this shampoo should leave your hair feeling softer, more manageable, more volumised and with more luster. Additionally this shampoo is free from parabens, SLS and phthalates, but it does include pro-vitamins and botanicals. Directions: Use at least three times each week. Wet hair and lather, massage onto scalp. Rinse and repeat if desired. For best results, follow with Jason Tea Tree Conditioner. Caution: For external use only. Keep out of reach of children. Avoid direct contact with eyes. If rash or irritation occurs, stop use and consult a physician. Water (Aqua), Cocamidopropyl Betaine, Sodium Lauryl Sulfoacetate, Lauryl Glucoside, Babassu Oil Polyglyceryl-4 Esters, Melaleuca Alternifolia (Tea Tree) Leaf Oil, Triticum Vulgare (Wheat) Germ Oil, Algae Extract, Aloe Barbadensis Leaf Juice*, Calendula Officinalis Flower Extract*, Chamomilla Recutita (Matricaria) Flower Extract*, Citrus Grandis (Grapefruit) Fruit Extract*, Equisetum Arvense Leaf Extract*, Humulus Lupulus (Hops) Extract, Salvia Officinalis (Sage) Extract, Urtica Dioica (Nettle) Leaf Extract*, Citric Acid, Glycerin, Guar Hydroxypropyltrimonium Chloride, Hydrolyzed Wheat Protein, Lecithin, Panthenol, Potassium Hydroxide, Retinyl Palmitate, Sodium Chloride, Sodium Citrate, Sodium Coco- Sulfate, Sodium Laurylglucosides Hydroxypropyl Sulfonate, Sodium PCA, Sodium Sulfate, Tocopherol, Tocopheryl Acetate, Alcohol*, Benzoic Acid, Benzyl Alcohol, Dehydroacetic Acid, Phenoxyethanol, Potassium Sorbate, Sodium Benzoate, Benzyl Benzoate, Benzyl Salicylate, Hexyl Cinnamal, Hydroxycitronellal , Hydroxyisohexyl 3-Cyclohexene Carboxaldehyde, Fragrance (Parfum) *Certified Organic Ingredient. The Jason Tea Tree Oil Therapy Shampoo - Normalising - 517ml product ethics are indicated below. To learn more about these product ethics and to see related products, follow the links below. 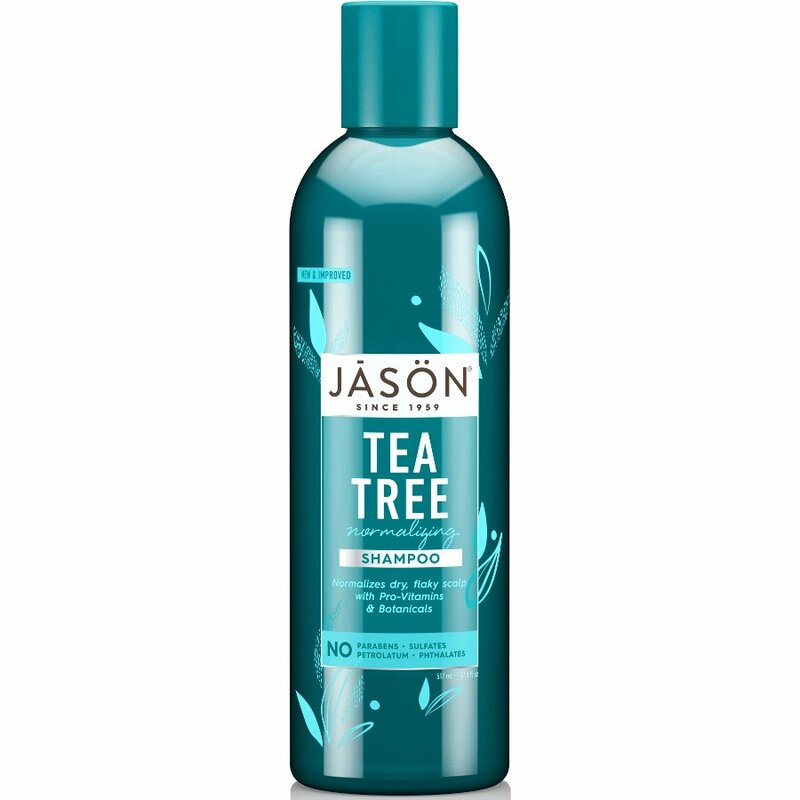 There are currently no questions to display about Jason Tea Tree Oil Therapy Shampoo - Normalising - 517ml.